A high powered Meanwell transformer with built-in 3 in1 dimming funtions - 1-10V, PWM signal and resistance. 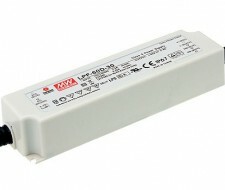 Suitable for either 12Vdc or 24Vdc LED lighting products. Compliant to worldwide safety regulations including short circuit, over current, over voltage and over temperature protection. Fully encapsulated with an IP67 rating making this unit not only waterproof but 90% efficient.